TechEd continued throughout the week with a myriad of sessions, code jams and hands on learning from SAP executives, product experts and influencers. Kelly Sotak, Rachna Pathak, Kavitha Pochampally, Lenny Stallman and myself made up the TeraThink team. We took full advantage of what TechEd had to offer by attending sessions late into the day. Rachna enjoyed building SAP Fiori Apps with SAP Screen Personas. Kavitha enriched her knowledge of SAPUI5 capabilities. Kelly debated SAP Data Services vs Data Hub integration strategies. I got to build applications on SAP Cloud Platform using SAP Web IDE. SAP properly orchestrated the logistics at the Venetian Sands Expo this year. They made it fun and easy to get in on the action of the show floor or to quietly immerse in session content not far away. Despite event organizers running out of sweatshirt giveaways, SAP partners had plenty of swag to give out as well as games to play. Lenny took part in an HTC VIVE virtual reality lightsaber competition and placed second! Despite Lenny’s stature on the leaderboard, his Jedi mind tricks did not work on airport security. Airport security confiscated the green lightsaber on his way out of town. 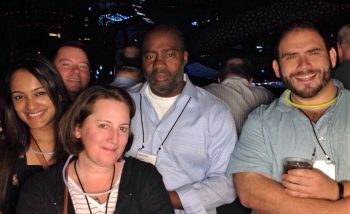 When the team wasn’t learning about how to build the intelligent enterprise by day, they were taking down the Venetian blackjack tables by night. We toasted the week on the terrace of the Omnia Nightclub overlooking the strip. Overall, it was a great trip. It was a chance to learn what is next with SAP and to bond as a TeraThink team. I am looking forward to taking what I learned and applying it to our clients. Lightsaber or not.